Firefighters extinguish a brush fire near Interstate Highway 280 in San Jose (August 30, 2016). 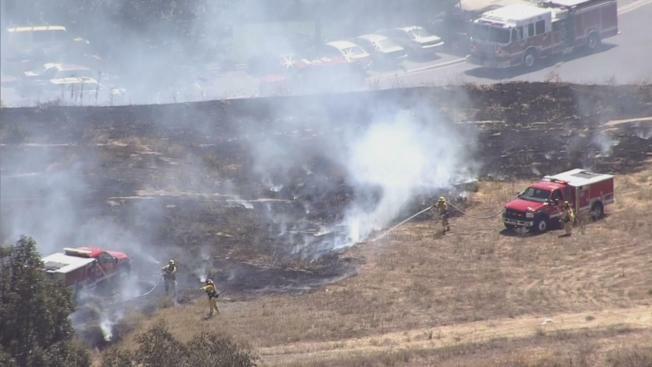 Vegetation fires on both sides of Interstate Highway 280 in San Jose have been extinguished Tuesday afternoon with no damage to any nearby buildings, a fire spokesman said. An initial blaze was reported at 11:55 a.m. with about a half-acre of vegetation burning in the area of Forestdale and Jeanne avenues, Fire Capt. Christopher Salcido said. Then at 12:16 p.m., another fire was reported on the other side of Highway 280 in the area of Story Road and Remillard Court, Salcido said. About an acre of vegetation was burning there. Both fires were extinguished by before 2 p.m., he said. No injuries were reported and no buildings were damaged or threatened. There were many school buses parked in a lot at the end of Remillard Court so fire crews worked aggressively to put out the flames before they moved too close to the buses, Salcido said. Fire officials did not determine whether the two fires, which were near each other although on opposite sides of Highway 280, were somehow related, Salcido said. He said traffic on the highway was not affected by the fires.